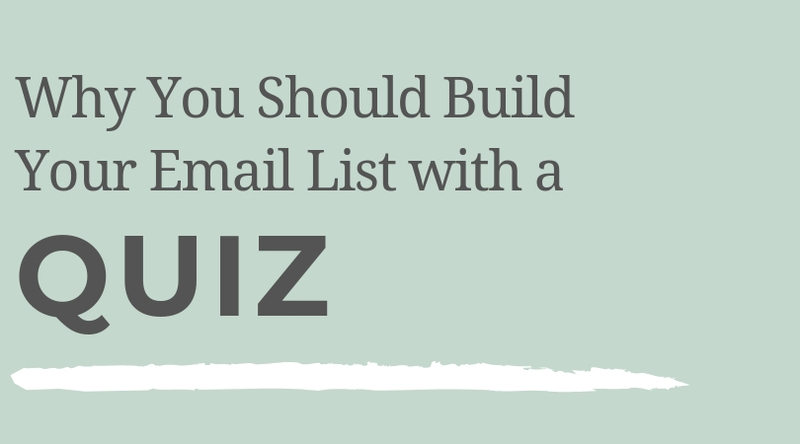 If you want to connect with your audience, grab their attention and quickly grow your email list, then building a quiz is the perfect solution! Building a quiz can not only help you get your audience to want to sign up, but it can also give you key insights into who your audience is and what they want from you! I am a certified partner with Interact, which means if you sign up for a free trial, then decide to purchase with their pro version, I will receive a commission at no additional cost to you. Building an email list is something I did not put a lot of thought into until I was years into my business. I made the classic mistake of throwing a subscription widget onto my website and food blog “just in case” and began slowly growing a list. The problem with that method was that I had NO purpose in gathering those email addresses and no plan for how I was going to communicate with them. It wasn’t until this year that I really decided to make building my list a priority. But then I was kind of stuck, unsure of HOW to actually grow my list, especially when I didn’t have thousands of pageviews. What I needed was a way to really capture my existing audience’s attention and grab their email so that I could start connecting with them and building trust! Reason #1: Everyone loves quizzes! Reason #3: You can customize the experience your new subscriber will have based on their quiz results. They are definitely a hot commodity right now with quizzes about everything from Disney characters to which signature cocktail drink you should have at your wedding… people LOVE taking quizzes to learn more about themselves! 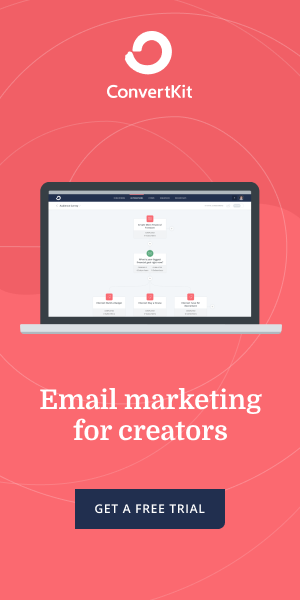 As a content creator, this is a huge opportunity to capitalize on something people already love to do but that will help you gather email addresses at the same time! Plus the potential value you can provide to your audience through quiz results is HUGE. For example, Megan Martin has a quiz all about how well your website converts, Jenna Kutcher has a quiz about what your marketing secret sauce is, The Creative at Heart Conference has a quiz about your creative personality that unlocks free resources that are customized to which creative personality you are. Interact found that quizzes have about a 50% conversion rate for lead generation. According to Sumo, the average email conversion rate is less than 2%. If growing your email list is a goal of yours, which would you choose? The slow rate is less than 2% or a 50% conversion? If you have 1000 visitors to your site a month, you could potentially gain 500 new subscribers per month from creating an Interact quiz versus a growing by just 20 subscribers over a month with a traditional lead generation tool like creating a free ebook or sending another freebie. Now not every quiz is going to be this way, but you have the opportunity to be super strategic in how you handle your subscribers from your quiz. For example, you can tailor an email sequence to follow each result which can be especially helpful if you are helping someone discover something about their business or themselves! For my food blog, I am setting up a quiz that will help my audience see how confident they are in the kitchen. Once they get their result, they will get a tailored email sequence of recipes that are a match for their confidence level. Be sure to have a plan for what you want to do with those email addresses. Will you be emailing out a weekly recap of content? Will you be segmenting your list based on the results they get from their quiz? Will you be sending a series of emails right after they take the quiz and then adding them back to your regular list? Think through those things before building out your quiz and mapping it to your email provider. When choosing a quiz topic, it’s helpful to think backwards. Why do you want people on your email list? What are you ultimately going to “sell” them? Whether it’s free content or an actual services or product offering, starting with that in mind will help you design a quiz around the people you want to be adding to your email list. 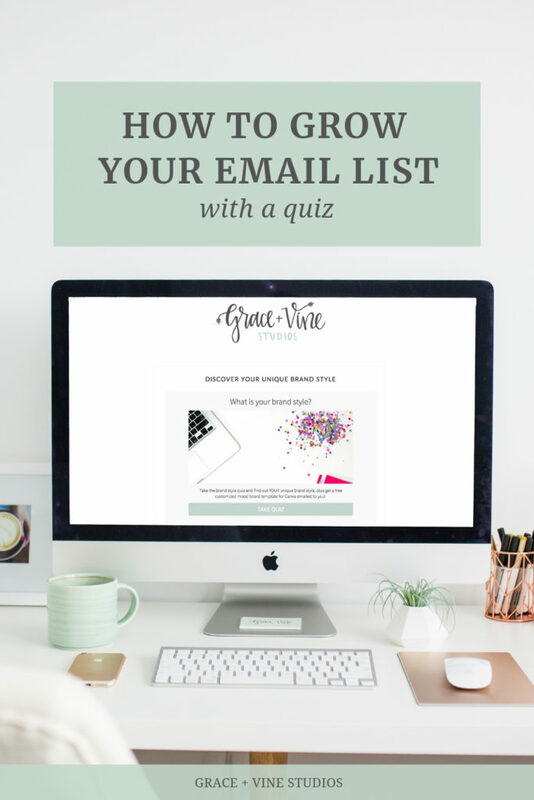 To me, the point of having a quiz to rapidly grow your email list isn’t to just fill your email list with people. But rather, you want to fill it with people who are ready to buy what you’re selling – again even if that is free content. Do you have a marketing email sequence already set up? If not, think through the plan with your new subscribers. How will they hear from you? What will you send them? 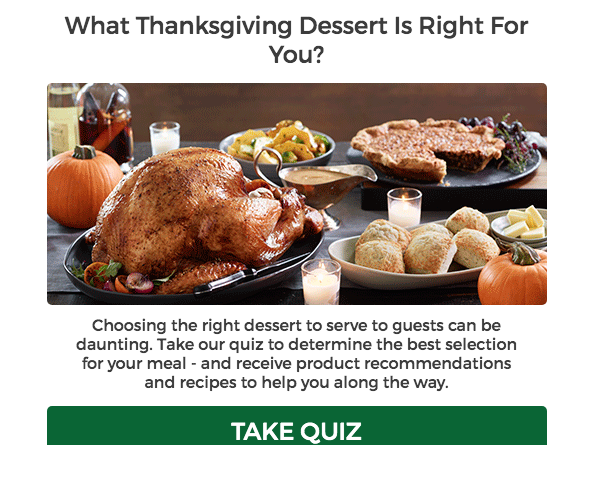 If you are a food blogger, maybe you’ll be sending them a curated sequence of recipes based on their quiz result. For lifestyle or fashion bloggers, the idea works the same. You’re going to be providing your new subscribers with free content after they sign up, but you want to make sure that they’re ready to read that free content and maybe purchase something based on your recommendations (affiliate links!). For creatives and solopreneurs, what service or offering do you want your list to buy from you? Even if it’s not an offer that is ready OR that they are ready to buy right now, think through the types of clients or customers that would purchase from you, even if it’s down the road. Think through offering something valuable to your quiz takers based on their results, whether that’s a curated list of resources, an actionable tip for their business or a free assessment. I’ve heard of other quiz companies out there and have created surveys with them in the past. Being a web designer, I’m really picky about user experience whenever I use third party tools. 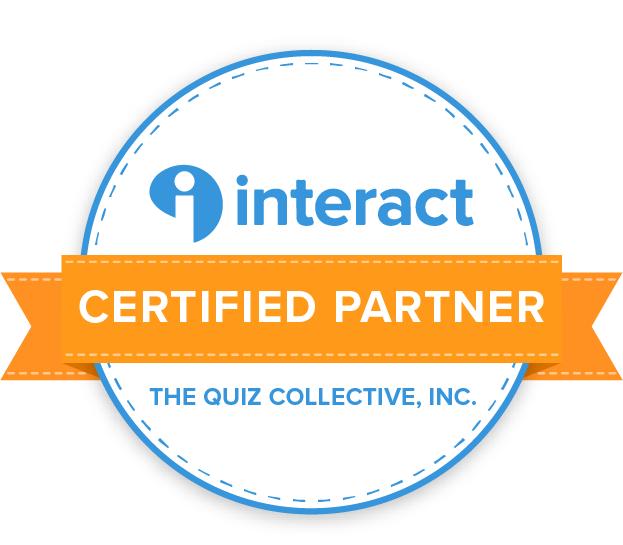 I was so impressed when I had my demo with Interact and they walked me through exactly how to create my first quiz! 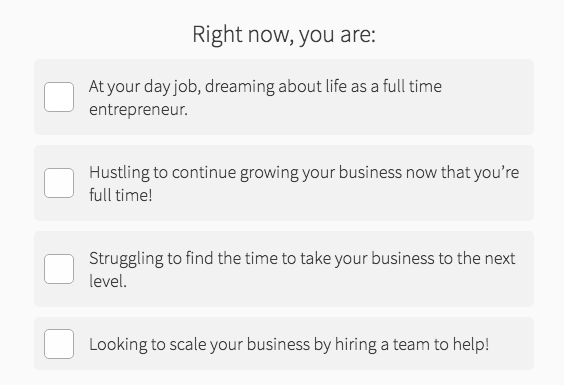 I’ve created two different quizzes now, one for each of my businesses, and have found that writing the questions out first really helps me to be able to see how the quiz will flow before spending my time building it. This method will help the process of creating your quiz be so much faster, too! Interact has so many templates to choose from that you can easily find a quiz that is already just about right for you and tweak it from there. Because I wanted to really experiment with building a quiz, I chose from scratch. Interact has three different quiz types to choose from depending on your needs. I’ve found that many examples of quizzes use the Personality style quiz which presents a final result at the end to help the quiz taker learn something about themselves i.e. a “personality”. Once you have your quiz looking the way that you want it to, it’s time to build out your questions. The questions on an Interact Quiz are all multiple choice, but you can also do image based multiple choice questions which is a fun an engaging way to get people to answer. The coolest part about setting up your questions is as you build each question, you can select which result correlates with which answer. But as a bonus, you can also select no correlation for questions and get vital information from your subscribers. They are already in question answering mode, so this is the perfect time to find out more about THEM. You could find out information about their pain points or preferences and then use that information to either build products that they might enjoy or to create content around that. When you choose your quiz results, you have the option to just display the results, place a call to action or redirect the page based on the result. Because I wanted to email the results to my subscribers (more on that below) I chose to just display the results. 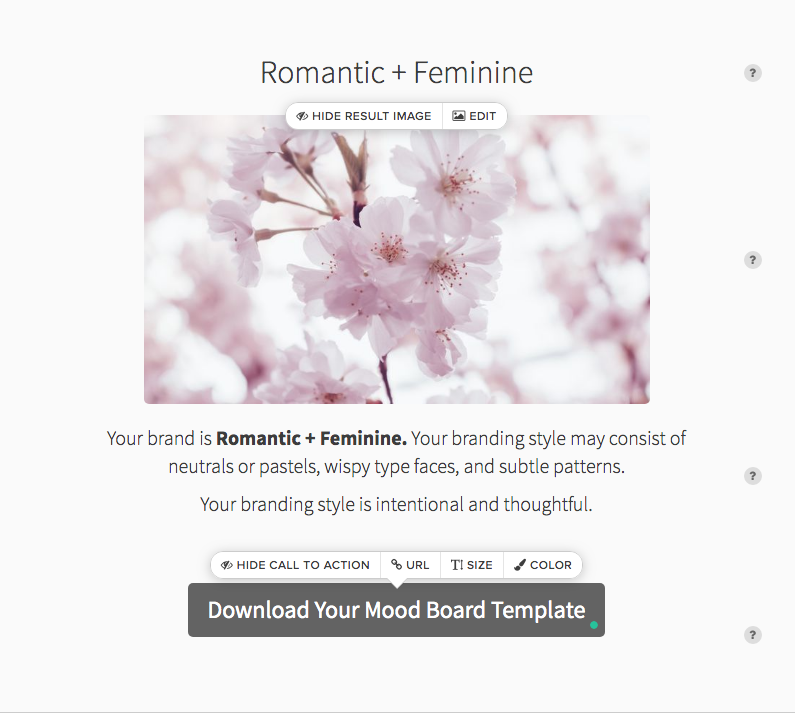 You can customize each result with a custom image, a description and a call to action. This step was the most challenging, but was intuitive enough once I understood the larger picture of how this all works. Interact sends your new email subscribers directly to your email list. Back to knowing how you want to use this list, you should have this already set up on your email provider before trying to connect your Interact quiz. 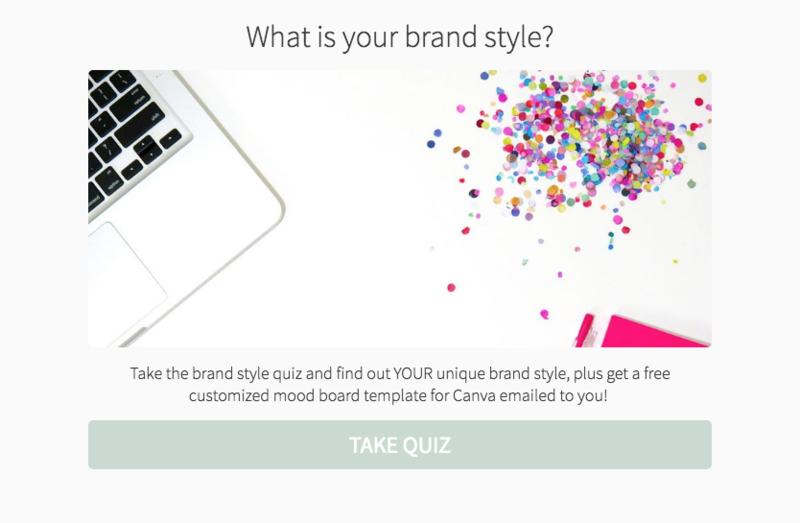 As an example, I wanted to have a specific email sent to people who took my Discover Your Brand Style quiz with their specific result and a free mood board download. This meant that I had to create a specific email sequence in Convertkit for each result and then select the action of adding subscribers to the specific sequence in Convertkit that matched their result. You don’t have to do anything this complicated though. You could simply add the subscribers to a form you already have set up in Convertkit, add them to a welcome sequence or add a custom field for the new subscribers to then add a rule in Convertkit for what should happen next. I found that adding a new subscriber to a sequence ended up being the most seamless way to get my subscribers added over on Convertkit. 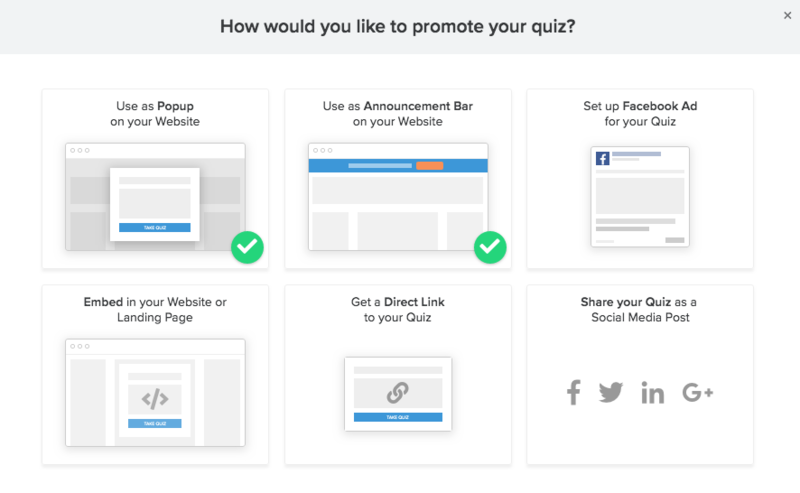 There are a few great ways to promote your quiz once it is up and running! 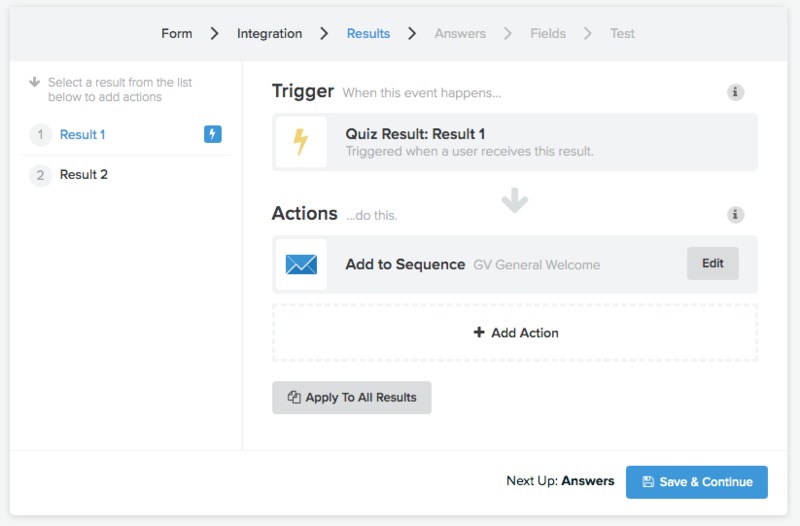 Interact makes it so easy to embed your quiz right into your website, either as a pop up, announcement bar, or just embedded into a widget or blog post. There was no tech needed to embed my quiz which was so nice! I chose to use the announcement bar and pop up feature to display my quiz. 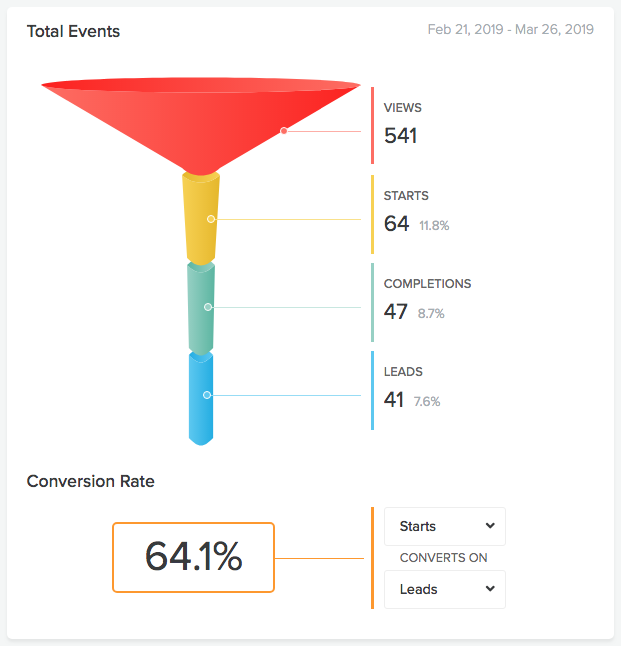 Interact has different levels of features depending on which plan you sign up for, but the Growth and Pro accounts both have amazing analytics for your quiz. When I first had my quiz set up, I kept a close eye on the drop off rate for my questions. Within the first week, I noticed that I was losing a ton of people after my first question. When I switched around my questions a bit, I started seeing that drop off rate decrease and the completion/lead rate increase! 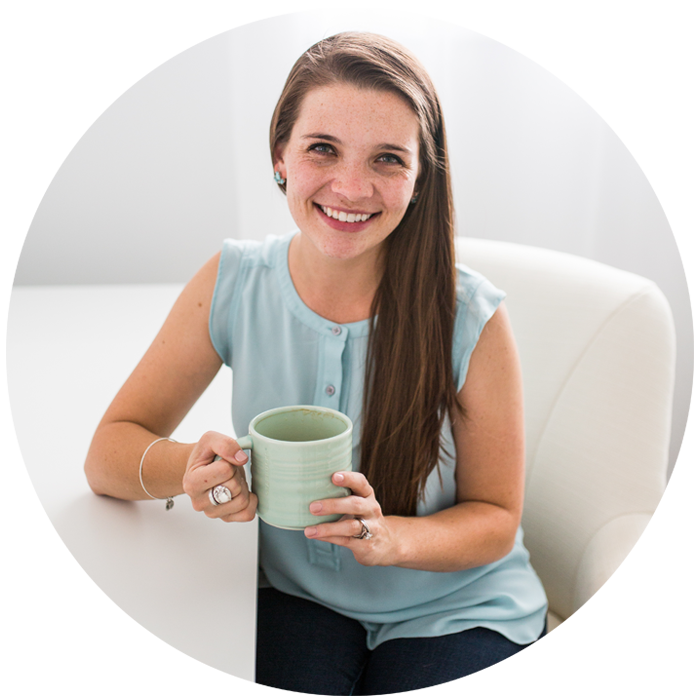 After a month of using Interact, I had 41 new leads/subscribers with a conversion rate of 64%. For comparison, in that same time, I only gained 3 subscribers for the sidebar email subscription box that I had on my sidebar during that same time (for a conversion rate of less than 4%). 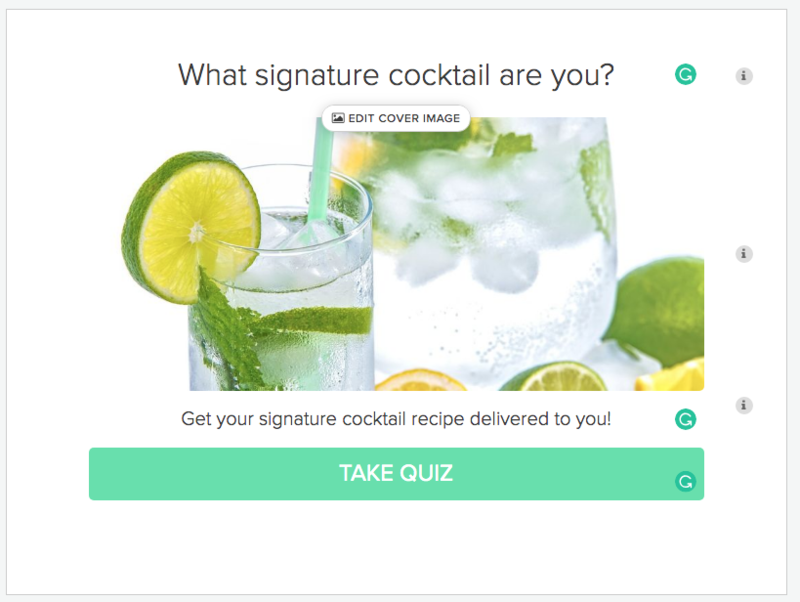 To start a free trial and build your own quiz, head over to Interact and get started! 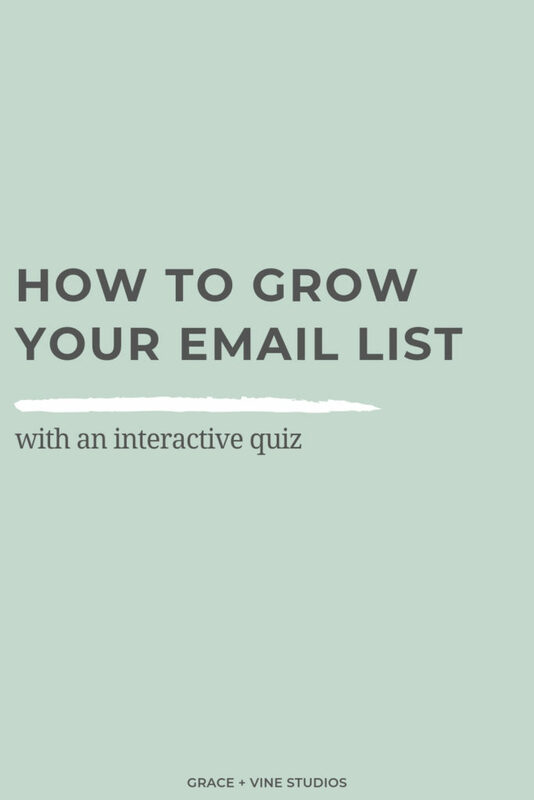 Have you ever considered a quiz to grow your email list? If you need some help brainstorming quiz topics, comment below. I’d love to help!